Well, it has been a week since my last post and apparently I have starved my sweet husband of reading materials on his break. Over the last week, I have been feeling a bit under the weather. It has been that icky in-between sick where I was not sick enough to stay home from work, but I felt bad enough to not want to do much of anything when I got home from work. After going to my sister’s bachlorette party on Saturday night in Ocean City, I think the cold/flu finally caught hold for real. I slept for several hours when I got home yesterday felt so icky, I stayed home today. Hopefully I will finally feel better soon. Last Thursday, I received a lovely package in the mail from Cathy. It contained the Beginner’s Exchange that I had joined on The Exchange Place. She stitched a lovely hardanger welcome heart in a soft pale green. It is absolutely lovely. 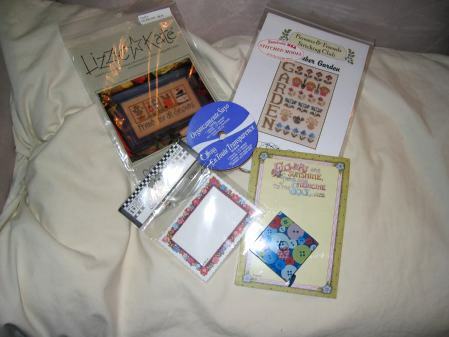 She also included two adorable patterns, notepads and a great retractible measuring tape (I needed one)!! Thanks Cathy!! Sorry you haven’t been feeling well. Hope you feel better soon. I’ve been feeling rather blah today but I think that’s just the weather. 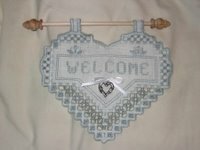 Glad you were happy with the Hardanger heart – it was a real treat to stitch it for you Leslie! This welcome heart is really very lovely!